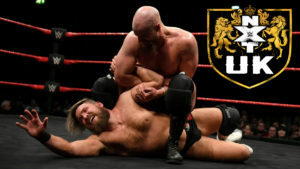 The Grizzled Young Vets put their tag titles on the line against Burch and Lorcan in a good main event in an entertaining episode of NXT UK that also featured Gallagher versus Bate and Ohno versus Walter. Toni Storm defends the NXT UK Women’s Title against Rhea Ripley in a good episode of NXT UK that also featured Andrews & Webster versus the Coffey brothers, and Shane Thorne versus Trent Seven. Undisputed Era puts their tag titles on the line against Heavy Machinery and a new contender for the NXT Women’s Title is decided on a very entertaining episode of NXT. Johnny Gargano clashes with Aleister Black in a steel cage on a good episode of NXT that also features the debut of the newly-named Dominik Dijakovic and a tag team battle featuring the team of Io Shirai and Dakota Kai versus the debuting Jessamyn Duke and Marina Shafir. Travis Banks returned to battle Joe Coffey, Andrews and Webster tried to impress against Drake and Gibson, Toni Storm took on Charlie Morgan, and Nina Samuels fought Killer Kelly in a match where one woman’s losing streak would be broken. Rhea Ripley puts her title on the line for the first time in a good match against Isla Dawn on a good episode of NXT UK. Dave Mastiff and Eddie Dennis both try to stay undefeated in the main event of an entertaining episode of NXT UK. Trent Seven battles Joe Coffey is a great main event grudge match on an entertaining episode of NXT UK. 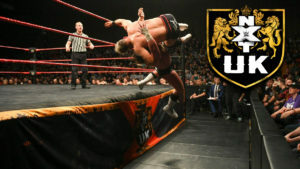 Ligero faced Tyson T-Bone, Dave Mastiff battled the Wild Boar, Rhea Ripley dominated Candy Floss, Joseph Conners fought Dan Maloney, and Travis Banks tried to overcome Wolfgang and his friends in an entertaining episode of NXT UK. Flash Morgan Webster battles Jordan Devlin in the main event, and Fabian Aicher takes on Mark Andrews in a good opening match on an entertaining episode of NXT UK. The first ever NXT UK Women’s Champion is crowned is a good episode of NXT UK that also featured Tyler Bate versus Joe Coffey, Dan Maloney versus Ligero, and Gibson and Drake versus Jordan and Williams. Jordan Devlin challenges Pete Dunne for the WWE UK Title in a great match on an otherwise pretty good episode of NXT UK. The semi-finals of the Women’s Title Tournament determined the two women who would challenge each other for the title, Dave Mastiff faced Tyson T-Bone, and the team of Andrews and Webster took on Huxley and Conners in a very good episode of NXT UK. Toni Storm faces Isla Dawn and Rhea Ripley takes on Xia Brookside in the final two matches of the quarter finals of the NXT UK Women’s Title Tournament. Also, Devlin battles Ligero in the main event of a good episode of NXT UK. The NXT UK Women’s Title Tournament begins with two good matches, Dave Mastiff and Tyson T-Bone cross paths, and Trent Seven battles Zack Gibson in a great main event on a very good episode of NXT UK. Tyler Bate faces James Drake and Wolfgang takes on Ashton Smith in a show with some good matches and the unveiling of the NXT Women’s Title. Andrews, Webster, and Smith attempt to get some payback on the Coffey brothers and Wolfgang, Jinny makes a statement with her arrival, and Gibson and Devlin look to continue their winning streaks on a good episode of NXT UK. Mark Andrews steps up and takes on Wolfgang after Travis Banks is mysteriously attacked in a good episode of NXT UK. Noam Dar and Zack Gibson have a great battle on another good episode of NXT UK. Noam Dar gets the title match he earned during the UK Tournament earlier this year in a great main event for an exciting start to the NXT UK weekly series! These WWE PC videos from Wrestlemania have all been very cool to see. Also, I can't wait to see ACH at Wrestlemania 36! Just in time for Wrestlemania weekend, listen as we preview and predict every single match on #Wrestlemania and #NXTTakeOver! Plus, the #G1Supercard and John Oliver's recent comments on #WWE, all on episode 123 of the Wrestling House Show! Where are the #Asukamania chants? Kofi might have gotten the most grief from the higher-ups on TV and in story lines, but Asuka has been treated the actual worst on her road to Wrestlemania. She's being treated like an afterthought.